Check out Minnesota Jets, June 15-16. With a recent resurgence of turbine flyers in the Minneapolis-St. Paul area, the Southern Minnesota Model Aircraft Club is welcoming jet flyers from all over. Come for a weekend of non-competitive open fun flying. AMA Turbine waiver is required. AMA rules will apply. EDF is welcome! Power is available (120v AC and 12v DC) on the flight line. Bring your kero. 1200 ft grass runway. 650 ft surfaced. Note, the last two miles to the field is via a low-maintenance road. The only props allowed will be kero powered. See you there! Check out more at smmac.com or call for info. 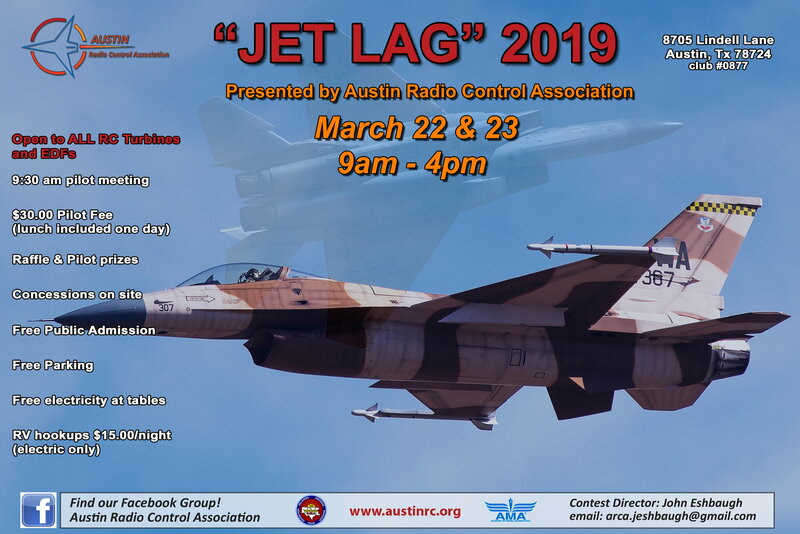 JET Lag 2019 is in FULL SIWNG! The weather is going to cooperate with us and the BBQ is happening tonight! If you are in the Austin, Houston or Dallas areas, IT'S ON! The Othello Jet Scramble (OJS) event is cancelled for this year. Nov 22nd thru the 24th Arizona Jet Rally, Mesa Az. Open to all Turbine aircraft, Electric are restricted to 120" (wingspan plus fuselage length and/or 100mm fan. June 15th & 16th 2019 – Minnesota Jets, Home of the Southern Minnesota Model Aircraft Club or call Larry Sorenson 612-756-0930 for info. July 14th -15th 201x - Highland Jets in Frankfort, NY www.mvfirebirds.com , Art ARRO, 315-865-4990, arrokats@twcny.rr.com. July 20th - 22nd 201x Wingham Jets, Wingham Ontario Canada. Early arrivals welcome. August 8th - 10th 2019 Michigan Jet Pilot's Boondoggle, Baldwin MI. September 26 th - Sep 30th 201x - Super Jets South, Gay Georgia Georgia Jets Flying Club, Inc.
Last edited by RCISFUN; 04-09-2019 at 01:23 PM.